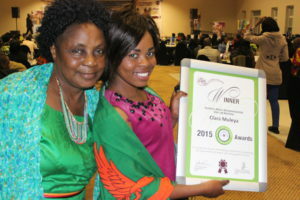 Clara Muleya has just won an award as the most impressive emerging entrepreneur at the prestigious Gender Links regional summit in Botswana beating the other nine contestants from different countries across SADC. She scored an incredible 89%. What is most amazing about this young woman is that she is not educated and is only 28 years old. Clara dropped out of school after she fell pregnant when she was still doing her secondary school studies. She was married off to the older man who later on became very abusive to her, both physically and emotionally. She was brutally savaged by her ex-husband and suffered serious injuries which required her to get a police report before she could be treated. Although Clara was afraid to terminate the abusive relationship with her husband, she realised that staying put would end up getting her killed, hence she said “enough is enough!” With support from her mother, she started a business selling curtains. She reinvested the profit that she made into buying more merchandise. Clara was introduced to Gender Links by the social worker at the Victim Support Unit in Solwezi. She was lucky to be included in entrepreneurship training phase 1 and 2, which taught her a lot about drafting a business plan, budgeting, recording of transactions and basic bookkeeping. She is very grateful that the training that Gender Links provided for free helped turn around the fortunes of her business. She started to realise a profit and the business grew exponentially. been through so far has taught her to be innovative. An exciting demonstration of her innovative skills is when she turns long trousers into shorts when they have not been bought. This has resulted in all her clothes being bought and has boosted her profit. Clara Muleya is a driver of change in every sense of the word because she is a living example of a young mother who is bravely moving on from a challenging background and running a successful business. She is an inspiration to many young women in her community and has vowed to preach to other young mothers about gender based violence. Although she is not formally educated, Clara is says that she intends to conduct market research to see the potential for growth in her business. She is looking forward to employing more women to help her sell merchandise in Solwezi town. Clara says her potential customers are community members and can be reached via cell phone or by approaching them directly. She already has a database list of potential customers. Clara has moved from selling her clothes in her house to renting a vending site provided by the council of Solwezi. She credits Gender Links for exposing her work to the council, hence enabling her to obtain this work space without any major hassle. The young woman is very ambitious and is even considering running a newspaper and radio advert to reach out to more customers, but as yet she is not financially ready. She also want to register her business under the Companies Act so that she can access finance from the bank. Isaac Zulu was the Gender Links staff member who reached out to her and she credits him for changing her life. Twelve months ago she did not believe she would obtain a passport let alone board a plane. All this has happened when Gender Links afforded her an opportunity to share her story at a regional summit. Clara says she has changed overnight from being a helpless bruised and battered housewife to becoming a celebrated up-and-coming entrepreneur in Solwezi.